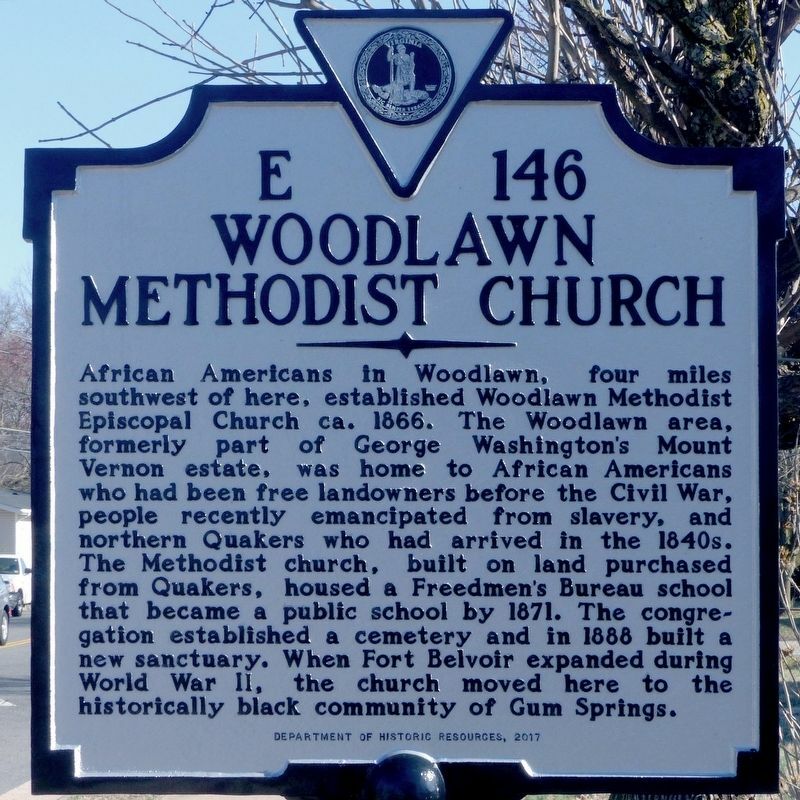 African Americans in Woodlawn, four miles southwest of here, established Woodlawn Methodist Episcopal Church ca. 1866. The Woodlawn area, formerly part of George Washington's Mount Vernon estate, was home to African Americans who had been free landowners before the Civil War, people recently emancipated from slavery, and northern Quakers who had arrived In the 1840s. 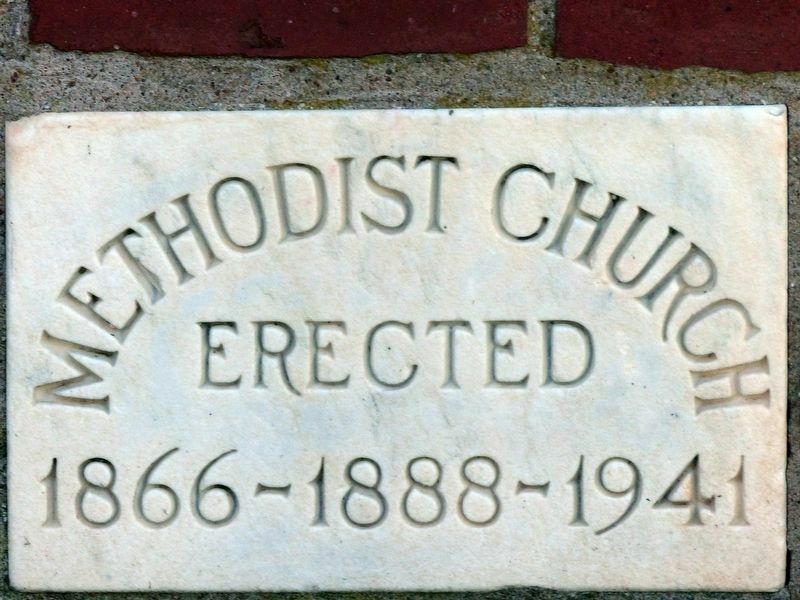 The Methodist church, built on land purchased from Quakers, housed a Freedmen's Bureau school that became a public school by 1871. The congregation established a cemetery and in 1888 built a new sanctuary. 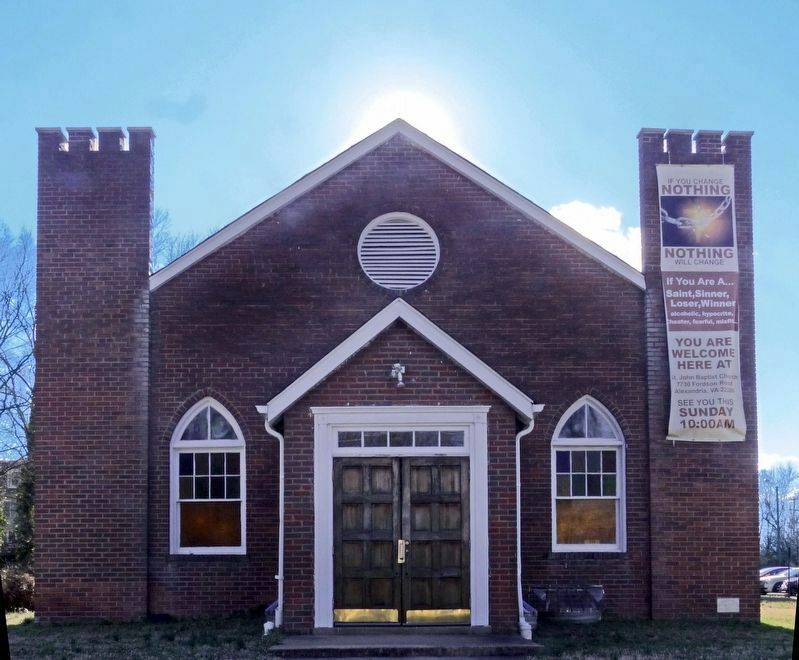 When Fort Belvoir expanded during World War II, the church moved here to the historically black community of Gum Springs. Location. 38° 44.829′ N, 77° 4.898′ W. Marker is in Gum Springs, Virginia, in Fairfax County. Marker is on Fordson Road, on the right when traveling south. Touch for map. Marker is at or near this postal address: 7730 Fordson Road, Alexandria VA 22306, United States of America. Touch for directions. (about 600 feet away, measured in a direct line); Hybla Valley Airport (approx. 0.2 miles away); Bethlehem Baptist Church (approx. ¼ mile away); US Route 1 Wall of Aviation (approx. half a mile away); Peake Family Cemetery (approx. 0.7 miles away); Huntley (approx. 1.4 miles away); a different marker also named Huntley (approx. 1½ miles away); A View from the Beginning (approx. 1½ miles away). 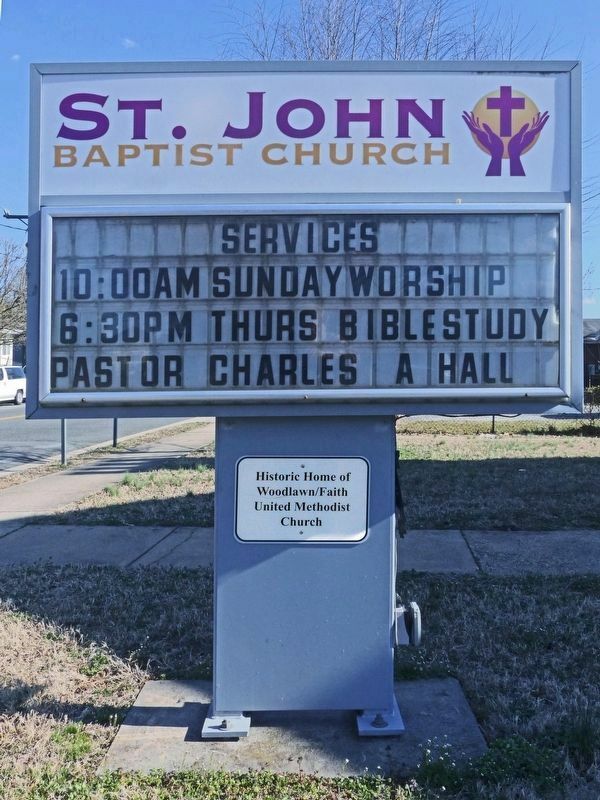 In January 2014, St. John Baptist Church moved to this building that formerly housed Woodlawn Methodist Church. More. 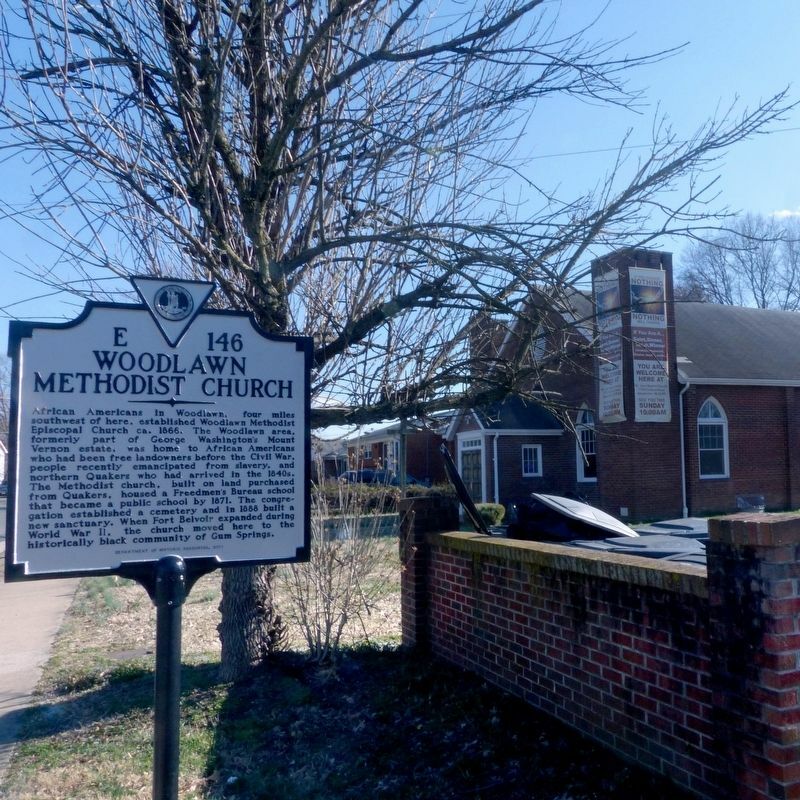 Search the internet for Woodlawn Methodist Church. Credits. This page was last revised on March 18, 2019. This page originally submitted on March 18, 2019, by Allen C. Browne of Silver Spring, Maryland. This page has been viewed 39 times since then. Photos: 1, 2, 3, 4, 5. submitted on March 18, 2019, by Allen C. Browne of Silver Spring, Maryland. • Bill Pfingsten was the editor who published this page.